A table describing each of a Spot Database Entry's fields is available here. Access to and management of the Spot Database is accomplished via controls in the Spot Database Window . The most important of these controls is the Spot Database Display - a grid that displays several Spot Database entries. Expanding the height of the Spot Database window will increase the number of Spot Database entries visible in the Spot Database Display, and expanding the width of this window will increase the number of fields visible in each entry. You can reformat the Spot Database Display's field order and field widths. The Spot Database Display shows a subset of all Spot Database Entries ; the number of QSOs in this subset is displayed in the main window's title bar. Specifying this subset is referred to as Filtering the Spot Database. You can control the order in which entries appear in the Spot Database Display, as well as the order of the columns used to display each entry's contents. Whether all columns in the Spot Database Display will be simultaneously visible depends on their number and width, as well as the width of the Main window. If all columns are not simultaneously visible, a horizontal scrollbar will be displayed along the bottom of the Spot Database Display; you can use this scrollbar to select the columns you wish to see. The small black rectangle to the left of the horizontal scrollbar can be dragged to the right to split the Spot Database Display into two independently scrollable sets of columns. You can adjust the boundary between the two sets by dragging the black rectangle to the left of the horizontal scrollbar at the bottom of the right-hand set of columns; to eliminate the right-hand set of columns, drag its black rectangle all the way to the left. DXLab provides Realtime Award Tracking service for seven award families and for callsign leaderboard competitions. The creation of a Spot Database Entry for a station with whom a QSO would advance your progress towards one of these awards or competitions can trigger and audible announcement or email message; such an Entry will be highlighted as needed. If you use only one log file in DXKeeper, then SpotCollector's out-of-the-box setting is appropriate (ask the operator for guidance when a log is opened in DXKeeper that is different than the one currently being consulted by SpotCollector). If you use DXKeeper to maintain logs of QSOs made from multiple DXCC entities, you'll find it convenient to specify that SpotCollector always consult the log associated with your home station; this keeps SpotCollector focused on the correct source of award progress when you use DXKeeper to open one of the other logs for QSO confirmation, QSL generation, or other activities. for CQ WAZ awards, the counter is a CQ zone. SpotCollector considers the Entry for a station that you've already worked on the Entry's band and in the Entry's mode to be unneeded, because another QSO with this station on the Entry's band and in the Entry's mode will not increase your chances of obtaining a confirmation of the Entity's counter(s), counter-band(s), or counter-mode(s). When the currently-open DXKeeper log provides realtime award tracking information for more than one award -- e.g. DXCC and WAZ -- a Spot Database Entry's category is determined by the award for which the Entry is most needed. The unworked counter category is considered the most needed, and the verified category is considered the least needed. By default, unworked counter Spot Database Entries and unworked band or mode or band-mode Spot Database Entries are rendered with a red font, unconfirmed Spot Database Entries with a blue font, and unneeded and verified Spot Database Entries with a black font; you can modify these colors via the Configuration window's Spot Database Display tab. A Color codes panel summarizing these font colors is displayed to the right of the Main window's Filter panel if window width permits; double-clicking the phrase Color codes directs SpotCollector to display the Configuration window's Spot Database Display tab. Spot Database entries that would give you a duplicate QSO -- i.e. with a callsign you've already worked -- for an unconfirmed band, mode, or counter are categorized as unneeded rather than unconfirmed. For example, suppose you have already worked, but not yet confirmed VU4DX on 20m SSB. Spot database entries for VU4DX on 20m SSB will be rendered in black - even though you don't have VU4 confirmed; that's because another QSO with VU4DX on 20m SSB will not advance your awards progress. However, spot database entries for VU4DY on 20m SSB would be colored blue, as working this station would give you a new way to confirm VU4 on 20m and SSB. Right-click the Entry and select the Display Award Tracking menu entry; SpotCollector will display an Award Tracking window that shows progress towards each award for which realtime award tracking information is provided in the currently-open log. If you have never installed or executed DXKeeper, then the Seek everything setting determines whether SpotCollector assumes that every Spot Database Entry is needed or unneeded. specify that the award counters, band, and mode should be announced; if realtime award tracking information is provided for more than one award in the currently open DXKeeper log and a Spot Database Entry is needed for more than one award, each award's counter is announced (e.g. "Yemen, zone 39, on 12 meters, RTTY, Marathon"
specify that the alarm should be triggered whenever a newly-created unworked Spot Database Entry is created, or only if this entry passes the Band, Mode, Origin, Continent, LotW, and eQSL filters. Each Spot Database Entry includes award progress information obtained the log file referenced for award progress. If you modify or delete a logged QSO in DXKeeper, SpotCollector is automatically directed to update this award progress information. If you are planning to modify or delete many QSOs in DXKeeper, it may be more efficient to disable these automatic updates, perform one update after all changes have been made, and then re-enable automatic updates. If automatic updates are left disabled, SpotCollector may incorrectly identify Spot Database Display entries for needed stations. If you change logs in DXKeeper while SpotCollector is running, SpotCollector will give you the choice of continuing to check progress against the previously-opened log, or switching to the new log. The file LotW.mdb is a database containing callsigns known to participate in the ARRL's Logbook of the World (LotW); recent versions of this database include each callsign's "date of last upload to LotW". 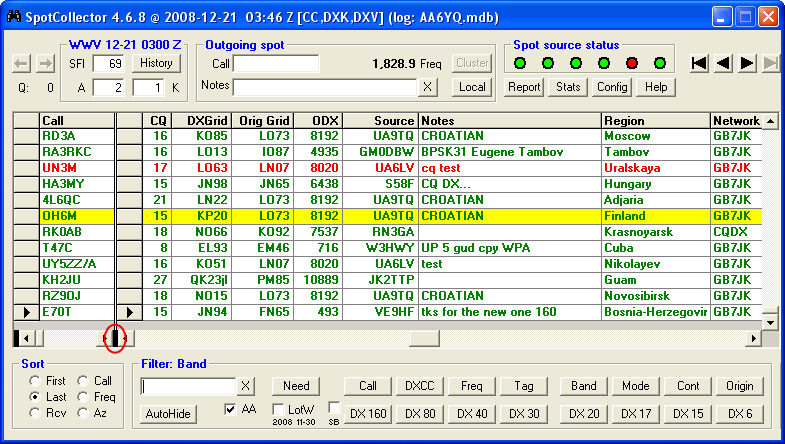 If at startup, LotW.mdb is present in DXView's Databases folder or in SpotCollector's Databases folder, then SpotCollector will set the LotW item of each Spot Database Entry it creates to indicate whether or not the entry's callsign is a known Logbook of the World participant; if LotW.mdb is not present in DXView's or SpotCollector's Databases folders, then each Spot Database Entry's LotW item will be set to 'N'. If the LotW database includes "date of last upload to LotW" information, then you can also specify the maximum age of a station's last upload to LotW; callsigns listed in LotW Database but with a "date of last upload" older than the specified age will not be considered to be an LotW participant. You can obtain the most recent LotW.mdb via the Databases tab of DXView's Databases folder. By default, Spot Database Entries whose callsigns are not known to participate in Logbook of the World and not Authenticity Guaranteed members of eQSL.cc are rendered with a white background; Spot Database Entries whose callsigns are known to participate in Logbook of the World are rendered with a yellow background, unless they are also Authenticity Guaranteed members of eQSL.cc -- in which case they are rendered with a light blue (cyan) background. You can modify these colors via the Configuration window's Spot Database Display tab. Checking the Announce LotW participation box directs SpotCollector to identify announced Spot Database entries whose callsigns are known to participate in Logbook of the World. The file eQSLAG.mdb is a database containing Authenticity Guaranteed members of eQSL.cc. If at startup, eQSLAG.mdb is present in DXView's Databases folder or in SpotCollector's Databases folder, then SpotCollector will set the eQSL item of each Spot Database Entry it creates to indicate whether or not the entry's callsign is an Authenticity Guaranteed member; if eQSLAG.mdb is not present in DXView's or SpotCollector's Databases folders, then each Spot Database Entry's eQSL item will be set to 'N'. You can obtain the most recent eQSLAG.mdb via the Databases tab of DXView's Databases folder. .
By default, Spot Database Entries whose callsigns are not Authenticity Guaranteed members of eQSL.cc and not known to participate in Logbook of the World are rendered with a white background. Spot Database Entries whose callsigns are known to participate in Logbook of the World are rendered with a pink background, unless they are also known to participate in Logbook of the World -- in which case they are rendered with a light blue (cyan) background You can modify these colors via the Configuration window's Spot Database Display tab. Checking the Announce eQSL participation box directs SpotCollector to identify announced Spot Database entries whose callsigns are Authenticity Guaranteed members of eQSL.cc. To change the width of a column in the Spot Database Display, position the cursor over the vertical line to the left or right of the column's caption; when properly positioned, the cursor will change to the Windows border adjustment cursor, allowing you to click and drag the column border to either expand or contract the column width as desired. To change the order of columns in the Spot Database Display, click on the caption of a column you wish to relocate. Then click-and-drag the column until the two red positioning triangles indicate the desired new location. To specify which fields appear as columns in the Spot Database Display, the caption appearing at the top of each column, and the the alignment of each information in each column, use the Layout panel in the Configuration window's Spot Database Display tab. To split the Spot Database Display into two independently scrollable sets of columns, use the black rectangle to the left of the horizontal scroll bar. Using the left mouse button to click-and-drag this rectangle to the right will create a second set of columns. To eliminate this second set of columns, click-and-drag this rectangle back to the left margin. To change the format used to display dates and times in the FirstTime, LastTime, and RcvdTime fields, use the Configuration window's dates and times setting. You can sort by any column in the Spot Database Display by double-clicking on its caption. The first time you do this, the Spot Database Display will be sorted in ascending order of the selected column; if you double-click the caption again, the Spot Database Display will be sorted in descending order. The Sort panel's caption will indicate how the Spot Database Display is being sorted by displaying the caption of the Spot Database Display column you double-clicked, followed by the word desc if the order is descending. only Spot Database Entries for for African, European, or Asian stations on 160m that were spotted from the North American East coast. When you specify a filter, the Spot Database Display immediately hides all Spot Database entries that don't conform. Spot Database Entries created after you specify a filter are added to the Spot Database, but only appear in the Spot Database Display if they conform to the current filter. If you modify or clear the current filter, the Spot Database Display is immediately updated to show only conforming entries. The number of entries in the Spot Database Display is shown in the Main window's title bar. SpotCollector also provides a more fine-grained mechanism for controlling the Spot Database Display: any individual Spot Database Entry can be designated as hidden. You can further specify a set of keywords that, if found in a spot's notes, will automatically designate its Spot Database Entry as hidden; the words pirate and slim are good candidates for this list. You can review all hidden entries and, if desired, un-hide them. which means that the Spot Database Display shows every Spot Database Entry except those that were hidden. The Spot Database window's filter panel provides three groups of filters: General, Context, and SQL. The five General filter buttons let you choose one of five criteria; some of these criteria reference the contents of the General Expression textbox, located on the left side of the Filter panel. Need When clicked without the Ctrl key being depressed, displays only unhidden Spot Database Entries with whom a QSO would advance your progress towards the DXCC, IOTA, Leaderboard, Marathon, VUCC WAS, WAZ or WPX awards on the bands and modes specified on the Awards tab of DXKeeper's configuration window. When clicked with the Ctrl key being depressed, displays only unhidden Spot Database Entries for needed DXCC entities. In either case, the Need Filter Mode setting determines whether unworked, or both unworked and unconfirmed Spot Database Entries are displayed. 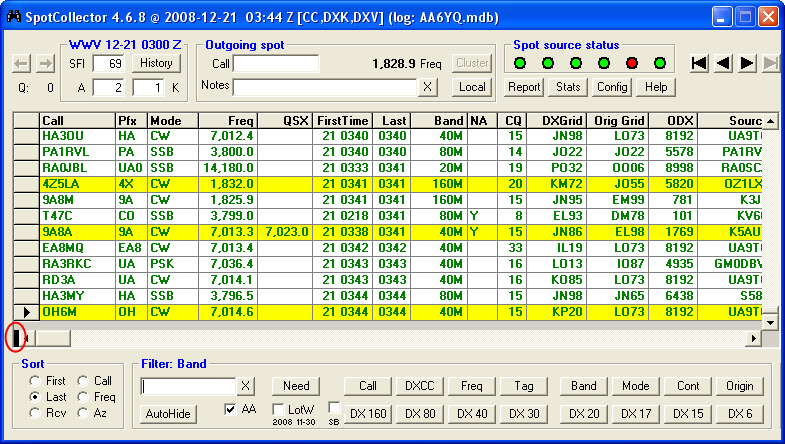 When unchecked, the Mrthn checkbox beneath the Need filter button removes CQ DX Marathon as a consideration in identifying and highlighting needed Spot Database Entries; this is useful early in the year when the large number of entries needed for CQ DX Marathon might make it difficult to notice entries needed for DXCC or WAZ. if the tag in the General Expression textbox does not contain a hyphen, then the Tag filter displays all Spot Database Entries whose Tags field contains the specified tag surrounded by angle brackets or contains the specified tag preceded by an angle bracket and followed by a hyphen and a membership number. General Expression textbox Spot Database Entry Tag List Match ? will match KH6/K6MIO, K6MIO, and K6MIO/KH6. With Commander running, enabling both the Frequency Filter and Frequency sort automatically shows recent spots near your transceiver frequency as you QSY. You can enable the Mode and/or Origin filter for additional specificity. When you right-click on a Spot Database Entry, SpotCollector displays a pop-up menu, once of whose items will display unhidden Spot Database Entries for DX stations spotted on frequencies near the Entry's frequency and younger than a specified age. To clear the General filters, click the button labeled X to the immediate right of the General Expression textbox. When the these filters are cleared, Spot Database Display shows all unhidden Spot Database Entries that conform to the four Context filters: Band, Mode, Continent, and Origin filters. SpotCollector six Context filters let you specify criteria independent of the General filters. The Band Filter enables you to display only unhidden Spot Database entries for DX stations spotted on frequencies within specified bands; clicking the Filter panel's Band button displays the Band Filter window, with Enable checkboxes for each amateur band from 160m to 12cm. This window also provides buttons that toggle groups of band checkboxes on or off; these allow you to, for example, enable all three WARC bands with a single mouse click, or disable the 6m, 4m, 2m, and 1.25m VHF bands with two mouse clicks. The Spot Database Display will not show Spot Database entries with frequencies in bands having Band Filter boxes un-checked. If Commander is running, checking the Transceiver Band Only box will automatically keep the Band filter set only show spots for your transceiver's current band; this feature is currently limited to 160m through 2m. SpotCollector retains a history of the most recent 16 Band filter configurations; you can navigate within this history using the Band filter's and buttons to travel backward and forward respectively. Moving backward means returning to a filter configuration that you have previously applied. Moving forward is only applicable after you have moved backward, effectively "undoing" each backward move.. When you specify a band's Start UTC or End UTC settings, Spot Database Entries whose frequencies are in this band will only be visible when the current UTC time is after the Start UTC and before the End UTC specified for that band. To temporarily disable "Start/End UTC" filtering for all bands, check the Ignore panel's Start & End times box. You can only modify a band's starting UTC time, ending UTC time, or maximum distance to closest spotting station if that band's Enable box is unchecked. Typically, one would uncheck a band's Enable box, specify or update these settings, and then check the band's Enable box to put those settings into action. To specify an absolute UTC time, simply enter that time; for example, if you want to filter out spot database entries that occur on 80m before 0900Z, then enter 0900 into the 80m band's Start UTC textbox. To specify a UTC time relative to sunrise or sunset, use the format SR+X, SR-X, SS+X, or SS-X where SR refers to the current sunrise time, SS refers to the current sunset time, and X is an offset in minutes. To filter out spot database entries that occur on 160m starting 45 minutes after sunrise, for example, type SR+45 into the 160m band's End UTC textbox. You can specify the current sunrise and sunset times in the Band Filter window's Sunrise & Sunset panel, but you must check the Ignore panel's Start & End times box before modifying the Sunrise UTC or Sunset UTC and then uncheck the Ignore panel's Start & End times box after completing these modifications. If you are running DXView version 2.8.9 or later, the Sunrise UTC or Sunset UTC will automatically be updated at 0Z each day, eliminating the need to manually keep these settings up to date;. Double-clicking the Sunrise UTC or Sunset UTC with the Ignore panel's Start & End times box unchecked will obtain an updated Sunrise or Sunset time from DXView, if running. If you specify an invalid starting or ending time, it will be rendered in red font. If you type a distance into a band's Max origin DX textbox, the band's Enable box will be disabled. After completing the entry or modification of this distance, check the band's Enable box; only Spot Database Entries on this band whose distance to the closest spotting station is equal to or less than the specified Max origin DX will be visible in the Spot Database Display. To temporarily disable "maximum distance to closest spotting station" filtering for all bands, check the Ignore panel's Max origin DX box. If desired, you can place the set/dxgrid command in the Spot Sources tab's initial cluster command so that SpotCollector will automatically configure all enabled clusters to provide spotting station GridSquares when connecting to the cluster. The Mode filter enables you to display only unhidden Spot Database entries for DX stations spotted in specified modes; clicking the Filter panel's Mode button displays the Mode Filter window, with checkboxes for several amateur modes. The Spot Database Display will not show Spot Database entries with modes having Mode Filter boxes un-checked. The Continent filter enables you to display only unhidden Spot database entries for DX stations located in specified continents; clicking the Filter panel's Cont button displays the Continent Filter window, with checkboxes for each of the seven continents. The Spot Database Display will not show Spot Database entries with continents having Continent Filter boxes unchecked. Unchecking the Continent filter's ? (unknown) checkbox is an effective way to suppress the display of Spots whose callsigns do not map to a DXCC entity; such Spots are generally bogus. The Origin filter enables you to display only unhidden Spot Database entries for DX stations spotted from specified geographic locations; clicking the Filter panel's Origin button displays the Origin Filter window, with checkboxes for the geographic locations shown in the following table. The Spot Database Display will not show Spot Database entries not spotted from any geographic location having Origin Filter boxes checked. Note that a particular DX station may have been spotted from multiple geographic locations. and the specified Maximum age is greater than 0, the current filter will be re-applied at the beginning of each new minute, hiding Spot Database Entries whose RcvdTime has become too old unless AutoScroll is disabled or activities like recomputing, pruning, or compacting the Spot Database are underway. If the LotW callsign database LotW.mdb is present in DXView's or SpotCollector's Database folder at startup, you can limit the display of Spot Database Entries to those whose callsigns are known to participate in the ARRL's Logbook of the World by checking the Filter panel's LotW box. If the Authenticity Guaranteed eQSL.cc callsign database eQSLAG.mdb is present in DXView's or SpotCollector's Database folder at startup, you can limit the display of Spot Database Entries to those whose callsigns are Authenticity Guaranteed members of eQSL.cc by checking the Filter panel's eQSL box. SQL filters enable complete control over the display of Spot Database Entries through the specification of SQL expressions that reference Spot Database Fields. You can specify up to 32 SQL expressions, organized as 4 groups of 8, that can used to filter the Spot Database Display by a button click. You can also directly type an SQL expression in the Filter panel and use it to filter the Spot Database Display by striking CTRL-S. Depressing the Ctrl key while clicking an SQL filter button displays SpotCollector's SQL Filter window, which allows you to specify a button caption and SQL expression for each of the 4 groups of 8 SQL filters. The Spot Database fields selector lists the name of each Spot Database Entry field; double-clicking in an SQL expression textbox in this window will append the selected field name to that textbox. To display or edit an SQL expression that's so long that it's not entirely visible within its textbox, click in the expression's textbox to select it, and then click the Expand button; to make all of the group's SQL expressions visible again, click the Contract button. To save all 32 SQL filters to a text file, click the Save button; to restore all SQL filters from a text file, click the Restore button. These functions can be used as a backup mechanism before making significant changes to an SQL expression, or to maintain multiple sets of SQL filters optimized for different operating conditions. An SQL filter remains in force until you click another SQL filter, or until you click the Filter panel's Need, Call, DXCC, or Freq filter buttons. shows how to use the AND operator to incorporate a constraint on the Spot Database Entry's reception time, in this case showing only Entries received after noon UTC on October 1, 2011. Notice the use of the ISO date format, which is YYYY-MM-DD HH:MM:SS . In SQL, date constants must be enclosed between # symbols. illustrates the use of the BETWEEN operator to see only Entries received within a specified date/time range. shows all Spot Database Entries for the Laine family, illustrating the use of the OR operator. shows all Entries for VK9X, but not those for VK9DX or VK9RY. uses the NOT operator to show all Entries for stations on Norfolk Island except Kirsti. Note that you can combine multiple wildcards to specify more complex patterns. in the expression with the contents of the Filter panel's General Expression textbox. This enables you to create SQL filters that reference a callsign, band, DXCC prefix, etc. that you specify. will display all needed Spot Database Entries on the current transceiver band. Any characters between // and // are ignored, and thus can be used as explanatory comments, e.g. If the Accept SQL Filter Updates option is enabled, other applications can update the contents of an SQL filter and invoke that Filter. DXKeeper uses this mechanism to update the SQL filter named NPOTA (if present) after it generates an NPOTA progress report. then the Spot Database Display is showing unhidden Spot Database entries whose callsign is SV2ASP/A with specific filtering by Band and Mode, but with no filtering by Continent or Origin. To see exactly which Bands and Modes are being filtered, you can click the Filter panel's Band and Mode buttons. SpotCollector retains a history of the most recent 64 filter changes, excluding changes to the Band, Mode, Continent, and Origin filters; you can navigate within this history using the Filter panel's and buttons to travel backward and forward respectively. Moving backward means returning to a filter that you have previously applied. Moving forward is only applicable after you have moved backward, effectively "undoing" each backward move..
You can hide an individual Spot Database Entry by right-clicking it, and choosing the Hide option in the resulting pop-up menu. will prevent hidden entries from becoming visible. To un-hide one or more hidden Spot Database Entries, click the Filter panel's AH button to display SpotCollector's AutoHide Filter window, and check the Display only hidden Spot Database Entries box; the Spot Database Display will now show only hidden entries that match the General and Context filters. You can un-hide an individual entry by right-clicking it, and choosing the Un-hide option in the resulting pop-up menu. Alternatively, you can click the AutoHide Filter window's Un-hide button to un-hide all entries shown in the Spot Database Display. Be sure to disable audio announcements if you are operating digital modes with a single soundcard. You can quickly enable or disable audio announcements by unchecking the Audio box in the Main window's Filter panel. If the Automatically re-enable Audio Alarm after 15 minutes option is enabled, disabling audio announcements by unchecking the Audio box will cause SpotCollector to re-enable audio announcements by re-checking the Audio box 15 minutes later; the word Audio will be rendered in blue font during this 15 minute interval. If SpotCollector is terminated during this 15-minute interval, Audio announcements will be enabled when SpotCollector next starts. When you left-click on a Spot Database Entry, SpotCollector notifies the DXLab application DXView, which if running displays information about the DX station's location -- latitude and longitude, beam heading, distance, local time, CQ zone, and ITU zone -- and highlights that location on a world map with a blue dot connected to your QTH by the signal path; DXView will also convey the location information to PropView. If the Convey DX Grid option is enabled and the DX station's Maidenhead gridsquare has been determined from spot notes, Spot Collector sends the gridsquare to DXView which uses it to plot a more accurate position and beam heading than could be accomplished from the DX callsign alone. Left-clicking a Spot Database Entry action disables AutoScroll mode if you depressed the Shift key when you clicked on the Spot Database Entry, or if you clicked on the Spot Database Entry's left-most column. display an Award Tracking window that shows progress towards each award for which realtime award tracking information is provided in the currently-open log; If the Award Tracking window is already being displayed, left-clicking on another Spot Database entry updates the Award Tracking window's contents to reflect progress for the newly-selected entry. When you double-click on a Spot Database Entry with SpotCollector not connected to WSJT-X, or if the Entry's mode is not FT8, JT65, JT65A, JT65B, JT65B2, JT65C, or JT65C2, SpotCollector notifies the DXLab applications DXView, DXKeeper, WinWarbler, Pathfinder, and Commander if they are currently running, and sends them information as described below. If you have specified a Digital Mode Application other than WinWarbler -- like MultiPSK -- then SpotCollector sends it information as described below. If the Entry's mode is RTTY, PSK31, PSK125, then WinWarbler is always notified. If the Entry's mode is CW, SSB, AM, or FM, then WinWarbler is only notified if the mode's Service box is checked in Actions with Digital Mode Application Connected panel. This panel also lets you specify whether WinWarbler's Main window should be automatically restored or minimized as a function of the Entry's mode. If the DX station's Maidenhead gridsquare has been determined from spot notes or a DXCC or USAP database lookup, Spot Collector sends the gridsquare to DXView, to the Digital Mode Application, and to DXKeeper for logging. placing the station's callsign in the call textbox in WinWarbler's QSO Info panel. places the station's callsign in the call textbox in WinWarbler's QSO Info panel. If the specified Digital Mode Application isn't running, then Commander QSYs your transceiver to the DX station's frequency and changes its mode to the DX station's mode, where the mode is determined by spot notes, spot frequency, and settings in the CW spot panel, RTTY spot panel, and non-RTTY Digital spot panel.. If the spot notes indicate that the station is operating in split mode and the Set Xcvr Split box is checked, Commander will place your transceiver in split mode (if supported) and set the alternate VFO to the reported split frequency; the words and abbreviations QSX, worked, wkd. wkd, up, down, dwn, and dn are assumed to indicate split operation. Double-clicking a Spot Database Entry disables AutoScroll mode if you depressed the Shift key when you double-clicked on the Spot Database Entry, or if you double-clicked on the Spot Database Entry's left-most column. SpotCollector maintains a history of up to 64 selected spots. The and buttons traverse that history backwards and forwards respectfully, QSYing the transceiver if Commander is running. Depressing the CTRL key while clicking either button will enable AutoScroll mode. You can scroll through the entries in the Spot Database using the vertical scrollbar along the right-hand margin of the Spot Database Display. A set of four VCR-style buttons located above the vertical scrollbar give you one-click access to the first, previous, next, and last Spot Database Entry. Normally, SpotCollector operates with its Autoscroll mode enabled, meaning that the Spot Database Display is automatically scrolled so that the most recent addition is always visible. While this is convenient when scanning for DX, the automatic scrolling can be problematic when inspecting an entry in detail. Vertically or horizontally scrolling the Spot Database Display, clicking or double-clicking a Spot Database Entry while depressing the Shift key or, clicking or double-clicking a Spot Database Entry in its left-most column all disable Autoscroll mode so that the selected Spot Database Entry remains visible even as new Spot Database Entries are added to the Spot Database. If the Date & Time Sort Order panel is set to ascending, or if the Sort panel is set to Callsign, Freq, or Az, then the most recent Spot Database Entry appears at the bottom of the Spot Database display. Clicking the last VCR-style button will enable Autoscroll mode; clicking the first, previous, or next buttons will disable Autoscroll mode so that incoming Spots no longer scroll the Spot Database Display (and thus may no longer be visible). If the Sort panel is set to First, Last, or Rcv and the Date & Time Sort Order panel is set to descending, then most recent Spot Database Entry appears at the top of the Spot Database display. Clicking the first VCR-style button will enable Autoscroll mode; clicking the previous, next, or last buttons will disable Autoscroll mode so that incoming Spots no longer scroll the Spot Database Display (and thus may no longer be visible). When Autoscroll is disabled, the word "Autoscroll" blinks in blue font above the first, previous, last, and next buttons; the "strike through" means disabled. If new Spot Database entries are added while Autoscroll is disabled, the word "Autoscroll" blinks in red font. Enabling Autoscroll mode by clicking either the last or first button (depending on the Sort selection and Sort order as described above) will display the new Spot Database entries, and clear the "Autoscroll" notification. Right-clicking a Spot Database Entry disables Autoscroll mode until you invoke a function from the right-mouse menu; if you right-click a Spot Database Entry and decide not to invoke one of the right-mouse menu functions, select the Enable Autoscroll function from the right-mouse menu. You can delete a Spot Database Entry, by right-clicking it, and choosing the Delete option in the resulting pop-up menu. If the Confirm spot deletion setting is enabled, a dialog box will appear asking you to confirm the deletion. This can be used to eliminate erroneous spots. You can also delete a Spot Database Entry by clicking in it's left-most column - a black triangle will appear in this column, and the entire entry will be highlighted - and then striking the Delete key, or the CTRL-X key; the entry will be deleted without seeking confirmation. Controls in the Spot Database window's Outgoing spot panel enable you to generate both local and DXCluster spots. In either case, enter the callsign of the DX station to be spotted in the panel's Call textbox, and information to accompany your spot in the panel's Notes textbox; the Notes textbox will not accept more than 29 characters, consistent with limits imposed by DXCluster software. Clicking the panel's X button will clear the Notes textbox. If Commander is running, the transceiver frequency will be used as the outgoing spot frequency, and is displayed in the panel; if Commander is not running, type the spot frequency in kilohertz into the freq textbox. Clicking the Cluster button will compose and forward a spot to the DXCluster whose Spot radio button is selected in the Telnet panel on the Configuration window's Spot Sources tab. If you are spotting via the CQDX IRC Channel, your spot will be handled by that channel's spotting robot, which is normally DXS. If DXS is unavailable, however, you must specify the DDX backup spotting robot. If the Cluster button is disabled ("grayed out"), you must specify the DXCluster that will convey your outgoing spots by selecting a Spot radio button. Clicking the Local button will enter the spot in your Spot Database (or update an existing Spot Database Entry) as if it had been received by a spot source, with your callsign shown as the Source and local shown as the Network. Depressing the CTRL key while clicking the Local button prompts you to specify the frequency to be used when creating or updating the Spot Database Entry. Clicking the Cluster or Local buttons enables Autoscroll mode. Striking Ctrl-Enter in the panel's Call or Notes textboxes is equivalent to clicking the Cluster button. Striking Ctrl-Del in either of these textboxes will clear their contents. If the Spot Xcvr split setting is enabled and Commander is running (version 5.9.2 or later), then the Notes textbox will track the current transceiver split frequency, e.g. "up 2.5" or "dn 1"; if Commander indicates that the transceiver is not in split mode, then the Notes textbox will be cleared. If the Save Spot Notes option is disabled, clicking either the Cluster or Local buttons will clear Notes textbox so you can easily enter new notes for the next outgoing spot. If the Save Spot Notes option is enabled, clicking either the Cluster or Local buttons will leave the Notes textbox; this is useful when all outgoing spots will have identical notes, e.g. when spotting stations participating in a particular contest. Depressing the CTRL key while clicking the panel's X button will toggle the state of the Save Spot Notes option. SpotCollector keeps track of the number of new spot database entries created during the most recent 60 minutes. Two sets of statistics are computed: by-band and by-continent. The by-band statistics are captured for 160m through 2m and are subject to the Mode filter, Continent filter, and Origin filter settings; the by-continent statistics are subject to the Band filter, Mode filter, and Origin filter settings. Spot statistics are presented in the Statistics window, which you can view by clicking the Main window's Stats button. Newly created spot database entries immediately update the spot statistics. Periodically, the statistics are updated to exclude spots older than 60 minutes; this rate is controlled by the Update Interval setting in the Spot Statistics panel on the Config window's Spot Database tab. When SpotCollector starts, it scans the spot database for any entries less than 60 minutes old and initializes the spot statistics accordingly. If Commander is running (version 6.6.4 or later), clicking the band button above a by-band statistic will QSY the transceiver to that band. CTRL-clicking a band button will filter the Spot Database Display to show only stations reported during the last 60 minutes that "pass" the Mode filter, Continent filter, and Origin filter. The Statistics window's Reset button clears all spot statistics. To display a graphical analysis of DX stations in the Spot Database Display, click the Main window's Prop button; SpotCollector will display a "bands vs. time-of-day" or "bands vs continents" analysis in the Propagation window, depending upon which analysis was last chosen. If the contents of the Spot Database Display change, either because new DX stations have appeared or because you've altered the Spot Database Display filtering, click the DX in Spot Database Display panel's Analyze button to update the displayed analysis. To display a graphical analysis of DX stations active over the past 24 hours that were spotted by a station within a specified distance of your QTH, click the Bands vs Time button, set the DX active during the past 24 hours panel's Maximum distance box to the specified distance, and click this panel's Filter & Analyze button. SpotCollector will filter the Spot Database Display to contain only DX stations active during the last 24 hours and spotted by a station within the specified distance of your QTH, and then display a "bands vs. time-of-day" analysis in the Propagation window. Striking the Enter key with the mouse cursor in the Maximum distance box is equivalent to clicking the Filter & Analyze button. If the Maximum distance box is empty, initiating a Filter & Analyze operation will set the Maximum distance box to 500. To display a graphical analysis of the location of DX stations active over the last N hours that were spotted by a station within a specified distance of your QTH, click the Bands vs Continents button, set the interval to N, set the DX active during the past N hours panel's Maximum distance box to the specified distance, and click this panel's Filter & Analyze button. SpotCollector will filter the Spot Database Display to contain only DX stations active during the last N hours and spotted by a station within the specified distance of your QTH, and then display a "bands vs. continents" analysis in the Propagation window. In a "bands vs. time-of-day" analysis, double-clicking a bar or count associated with a band will filter the Spot Database Display to show only Spot Database Entries on that band at that time-of-day, spotted by a station within a specified distance of your QTH, and subject to current Mode, Continent, and Origin filters. Double-clicking while depressing the CTRL key will filter the Spot Database Display to show only Spot Database Entries on that band at that time-of-day. In a "bands vs. continents" analysis, double-clicking a bar or count associated with a band will filter the Spot Database Display to show only Spot Database Entries on that band from that continent during the specified interval, spotted by a station within a specified distance of your QTH, and subject to current Mode, Continent, and Origin filters. Double-clicking while depressing the CTRL key will filter the Spot Database Display to show only Spot Database Entries on that band from that continent. You can configure SpotCollector to monitor a specific callsign, sending email messages reporting "where heard" information on the hour and half-hour, and recording these reports in a text file. The only limit to the growth of SpotCollector's Spot Database is the amount of free storage on its storage volume. Use the facilities of the Size Limit panel on the Configuration window's Spot Database tab to periodically prune the size of the Spot Database, or clear it entirely. SpotCollector monitors each DXCluster and the #CQDX IRC channel for WWV announcements. Data from the most recent announcement is shown in the Spot Display window's WWV panel. SpotCollector maintains a history of these parameters in the file SolarHistory.txt; to graphically display the last 31 days of history, click the WWV panel's history button; depressing the CTRL key while clicking the history button ensures that the window containing the solar history display is never obscured by other windows. For each day, the solar flux index is shown in green, the A index is shown in red, and the K index is shown in blue. The daily range of each index is plotted as a vertical line, with the most recent daily value plotted as a solid circle. The checkboxes below the display let you examine trends in the SFI, A, and K parameters either individually, or together. Since the sun completes a revolution every 27 days, its behavior 27 days ago is often helpful in predicting current behavior; this point in time is highlighted in red font. Descriptions of these parameters and their role in HF radio propagation are described in the many links available in AC6V's excellent Propagation page. 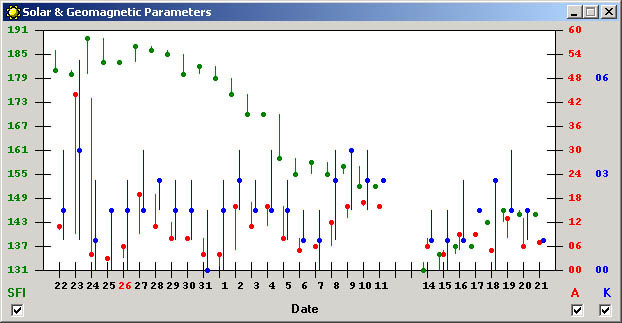 PropView automatically references these parameters when generating its prediction of openings over a 24-hour period. SpotCollector performs lookups in a DXCC database to determine a callsign's DXCC entity and as much location information as can be unambiguously determined from that callsign -- e.g. CQ zone, ITU zone, and IOTA tag. If DXView is installed, then SpotCollector uses the DXCC database located in the DXCC.mdb file in DXView's Databases sub-folder; If DXView is not installed, then SpotCollector uses the DXCC database located in the DXCC.mdb file in SpotCollector's own Databases sub-folder. Due to the policies of the United States Federal Communications Commission (FCC), the DXCC database cannot unambiguously determine location information from callsigns issued to stations in the United States, Alaska, Puerto Rico, US Virgin Islands, Baker Howland Island, Guam, Johnston Island, Midway Island, Palmyra Island, Kingman Reef, Hawaii, Kure Island, American Samoa, Wake Island, or the Marianas Islands. To accurately determine location information from callsigns in these DXCC entities, an optional US and Possessions (USAP) database is available. When present in either DXView's or SpotCollector's Databases sub-folder, SpotCollector uses the USAP database to determine location information for callsigns in these entities. The current USAP database is available in https://www.dxlabsuite.com/dxview/USAP.exe . Note that DXView will report the presence of an updated USAP database, and can be directed to download and install the updated database with a single click. Occasionally, stations use callsigns that the DXCC and USAP databases cannot unambiguously or correctly map to the DXCC entity in which the station is operating; examples include callsigns like TO5M or E51DX. To address such situations, SpotCollector permits the definition of Overrides. Cumulative CumulativeNotes all spots (spotting callsign, spotting callsign location, and spot notes) received for this station in order of ascending time, separated by carriage return and line feed; if Ignore empty spot notes is enabled, this item will not contain spots whose notes were empty. The FirstTime, LastTime, FirstOpLocationTime, and LastOpLocationTime fields are computed using the timestamps received with each spot unless they are in the future with respect to your PC's local clock; in this case, your PC's local clock is used. The geographic location of the station posting a spot is inferred from its callsign. This is not always accurate, as when AA6YQ operates from the east coast of North America without appending a /1 to his call.